2019 dates: Thursday 12th, Friday 13th & Saturday 14th September. Islands, environments and remote communities. Whilst the Festival is curated we do accept submissions particularly of short films. If you would like to submit your film for consideration please email Festival Programmer: Muriel Ann Macleod : muriel@ruralnations.com. Note: We would require to be able to view the full film content before it can be considered for screening at HIFF 2019, please supply a link to your film via vimeo or similar. Also, we screen current content so submitted film should be made in the last three years. Fifth Hebrides International Film Festival gives pause for thought over scale of island development. If the Hebrides International Film Festival does anything this year, it will hopefully “make us pause for a minute and think about what we are doing to the planet and the island”. That was the message from film festival curator Muriel Ann Macleod on today’s opening day of the festival (Wednesday, September 19). 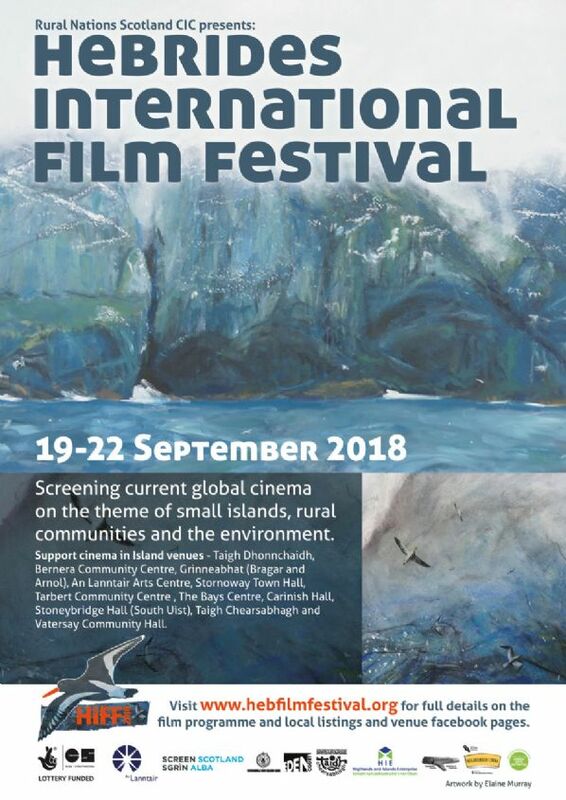 The fifth Hebrides International Film Festival is taking place in venues throughout the Outer Hebrides from now until Saturday (September 22) – and Muriel Ann said it raised “important questions locally”, such as whether we were “really doing enough to preserve the seas of the Hebrides”. Muriel Ann, director of the Rural Nations Community Interest Company, was speaking from Brussels, where she is representing the Outer Hebrides as part of the Reclaim the Future project, part-funded by Creative Europe. She said: “I’ve brought our short exhibition environmental film Eve v Lucy and the Harris Carnival banner representing the islands. But of course I’d rather be in Lewis for the opening of HIFF on Wednesday night. I’m really pleased with the festival. 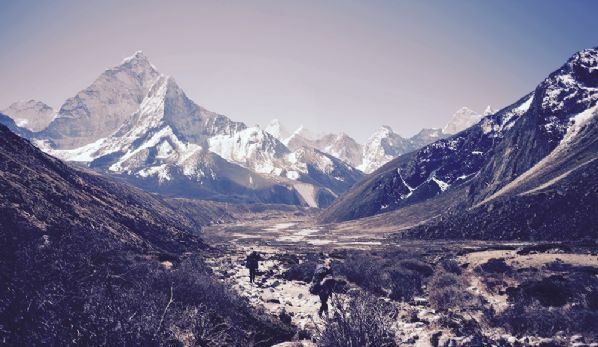 “This year we engage with cultural diversity with films like Lerd – A Man of Integrity, as well as strong environmental films like Blue and A River Below, with questions asked around the importance of the environment next to big business and the driver to make money. “These are important questions locally. How many wind farms do we need when we could have solar farms or wave power? Three big wind farm schemes are planned for the Isle of Lewis – the Forsa development at Tolsta and Lewis Wind Power’s Stornoway Wind Farm project and Uisenis scheme in Eishken. Lewis Wind Power is part-owned by French multinational EDF Energy and wants to be allowed to site offshore-sized turbines on land on Lewis. The core of this year’s film festival is the screening of current environmental documentary features such as Blue, which has been described by Greenpeace as “a cinematic song for our oceans”. It was filmed in Australia, Indonesia, the Philippines, South Pacific and United States. Similarly, A Plastic Ocean was shot over four years at 20 locations across the planet and shines a light on the plastic pollution crisis. However, environmental questions relating to land also get the HIFF treatment, with Lerd – A Man of Integrity opening the film festival tonight in An Lanntair. Lerd, which won the Un Certain Regard Award at the Cannes Film Festival, is about a gold fish farmer in a village in northern Iran, whose attempts to make an honest living come up against a corrupt system, where money and power beat environmental concerns. The fish farmer finds out his neighbour has poisoned the water in a bid to get control of his land. All the films on the Hebrides International Film Festival have been chosen because “they are the best from current world cinema”, having been made within the last three years. Many are award winners and all are high quality. There are approximately 26 feature films on the programme and there will be a total of 56 screenings across the venues over the four days, with each screening including a feature film and an accompanying short. There are around 13 ‘shorts’ on the programme including Cianalas, by young Hebridean Zoe Paterson Macinnes, and MS, Mexico and Me which tells the story of Aileen Hunt who travelled from her home in Uig to Mexico for stem cell treatment, in a bid to halt the progression of multiple sclerosis. The Hebrides International Film Festival is supported by Creative Scotland, HIE and other agencies and presented in collaboration with An Lanntair. The festival has a broad theme of “islands, environmental issues and indigenous peoples” and a particular focus on the “ocean” theme this year, although it always includes a variety of genres, so there is art, comedy and children’s film as well as drama and documentary. Final preparations are underway for the fifth Hebrides International Film Festival – taking place throughout the Outer Hebrides from Wednesday, 19 September to Saturday, 22 September. The festival, which is supported by Creative Scotland, HIE and other agencies and presented in col-laboration with An Lanntair, has developed into a high-quality event, which brings the latest in world cinema to the islands. Only films made within the last three years are eligible to be included in the programme, which is curated by Muriel Ann Macleod, director of the Rural Nations Community Interest Company, with the support of Paul Taylor, the cinema programmer at Eden Court Theatre. 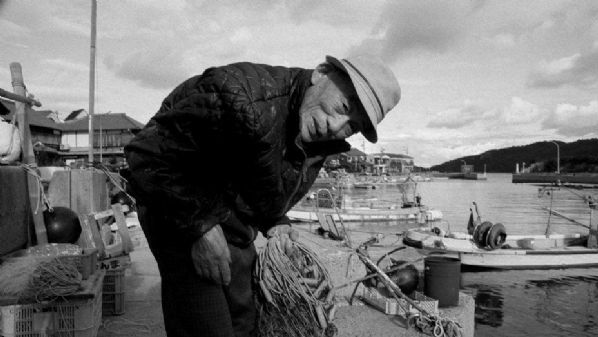 All the films being shown fit within the festival’s broad theme of “islands, environmental issues and indigenous peoples” and this year there is a particular focus on the “ocean” theme. Although there are variety of genres in the programme – including art, comedy, children’s film, drama and surf film – there is always a strong element of documentary or political and environmen-tal commentary, and two of the biggest films this year document what is going on within our oceans and rivers. In particular, the global environmental crisis of plastic pollution. One of the headline documentaries, Blue, has been described by Greenpeace as a “cinematic song for our oceans; beautiful, intimate and grand” and was filmed in Australia, Indonesia, the Philip-pines, South Pacific and United States. Similarly, A Plastic Ocean was shot over four years at 20 locations across the planet and documents how wildlife – and people – are living among the toxic refuse. As well as having been made within the last three years, all the films on the programme are chosen for their high quality and many are award winners. There are approximately 26 feature films on the programme and there will be a total of 56 screen-ings across the venues over the four days, with each screening including a feature film and an ac-companying short. There are around 13 ‘shorts’ on the programme including Cianalas by young Hebridean Zoe Paterson Macinnes, which is currently being well received. The films are a mix of English language features and foreign films with full English subtitles. The full programme is available online now – at www.hebfilmfestival.org – and tickets can also be bought through the website by following the links to the Eventbrite marketplace. For festival films that are being shown at An Lanntair, tickets are available via their website (not Evenbrite) – at lanntair.com – and they also have a series of free films on in their Pocket Cinema. In general, tickets can also be bought at venue doors, although it is advisable to book in advance for the smaller venues, where space is more limited. Tickets are priced £7 adults, £5 concession and £4 for under-16s, with a season ticket for £50 which allows entry to everything. There will also be special daytime screenings for school groups and a number of masterclasses from film makers, as well as environmental lectures and a beach clean. Full details of the masterclasses and lecturers are also available on the website. Programmes are also being printed and will be widely distributed. The Hebridean International Film Festival grew out of a programme started by Regional Screen Scotland five years ago, where a number of remote and rural film festivals were given three-year funding and mentorship. It was also a natural successor to the Hebrides Coastal Film Festival. For programmer and director Muriel Ann, her original involvement came out of wanting to make a shift from theatre into filmmaking. HIFF will run between Wednesday 19th- Saturday 22nd September 2018. We're delighted to have several highly anticipated environmental features coming to the festival this year, including BLUE an Australian documentary by director Karen Holden. Find out more about the film and how you can take action here. Screening details for HIFF will be announced shortly. The HIFF team were very sorry to hear about the sad passing of film maker Roger Stotesbury whose short film Hand Woven Lives screened at the Hebrides International Film Festival in September 2017. The film was made on the Isle of Lewis with local residents in 2016. At this time Roger attended HIFF 2016 contributing to our masterclasses and formation of a film collective. He presented his film to us for screening at the 2017 festival, where it was very well received by locals who appreciated seeing local stories captured sensitively and portrayed beautfully in the short doc which screened throughout the islands venues. We would like to thank Roger for his contribution to film, for capturing our lives here and sharing this with the world, and for his enthusiasm and appreciation for the Hebrides. Offering condolences to his family and friends, and hoping you will enjoy watching the film below as a lasting legacy of his ability to connect with people. Read more about Roger's film making at Cut to the Doc. The Hebrides International Film Festival 2018 (HIFF) dates are Wednesday 19th to Saturday 22nd September 2018.